So I HAD to make a card today using one of my new "toys". 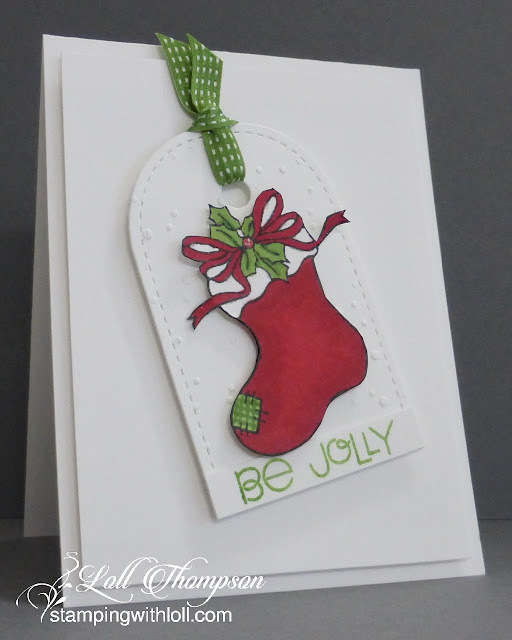 I saw that the challenge this week at Merry Monday was to make a card with a tag. I kept this CAS by just having the tag and image. I did add a little wink of stella to the ribbon and holly, which doesn't show in the photo above. I'll include a close up below so you can see a bit of the sparkle. 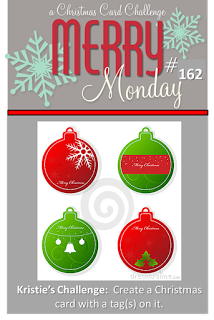 Merry Monday #162 - Tag, You're it! This stocking made the perfect tag, Loll! I love the bit of sparkle and all that white space! Thanks for sharing with us at Merry Monday! Wow Loll, this is just so fabulous! Very classy and Such a lovely combination of the tag and that sweet stocking. Gorgeous card & Tag Loll, so pretty. You take care with your knee, don't rush it, these things take time my friend. This is beautiful, Loll. I love your use of all that glorious white space, to make the colours in the image really pop. Absolutely adorable, Loll. Lovely colouring and touch of sparkle. New stuff is always so much fun! Great stocking image and perfect on that tag! Fabulous card for Merry Monday! Love this CAS Christmas card! The stocking is so colorful and the Wink of Stella gives it just the right amount of glitz and glam! So cute - love the added sparkle! Loll, your stocking is just beautiful and your overall design simply stunning!! Thanks so much for playing with us this week at Merry Monday! Love the stocking...and the use of a tag. Haven't commented of late but always look and get inspiration from you, Loll. Sharing our lovely weather...shhhh, the NW is great! Glad you are getting along better but be careful...use poles or a cane for the time being? Beautiful card Loll. Love the pretty stocking. That stocking is so cute, Loll, and I love the added snow and ribbon. Take card of yourself. Such a sweet stocking, Loll! It fits perfectly on the tag. Thank you for sharing with us at Merry Monday! Such a fabulous and festive Holiday card Loll and I love that sweet tag. Hope your knee isn't playing up after your watering exploits! Lovely elegant Christmas card Loll, love every design element. Thanks for joining us this week at Merry Monday. Oh Loll, this is fabulous! The sparkle really adds a perfect finishing touch on your sweet card! This is so charming, Loll! 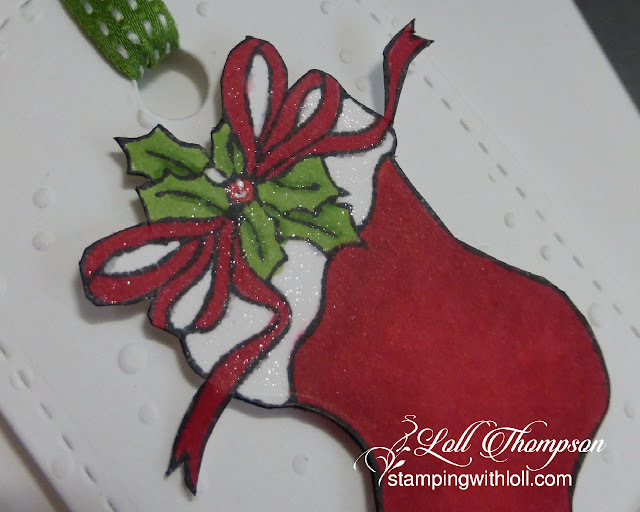 I love your stocking and the embossed tag is the perfect background! I love how you added sparkle to the red bow, too...so sweet!